China’s projects of ports, naval bases and surveillance posts in Indian Ocean will encircle India. This is commonly called as “String of Pearls“. “China-Pakistan Economic Corridor” (CPEC)- Flagship project under the mega OBOR initiative, passes through Pak occupied part of Kashmir. This step of China undermines India’s sovereignty as China didn’t take permission from India. China may take control of the developing countries through its investments, this may impact the trade relations between India and these countries. If India joins in OBOR, Chinese companies may supervise the projects in India under OBOR. This will be a minus because Chinese companies may not create employment opportunities for local people and may not care about local developmental needs. India’s major drawback is lack of infrastructure. If India partners with OBOR, it can utilize China’s investments and technology to overcome this drawback. 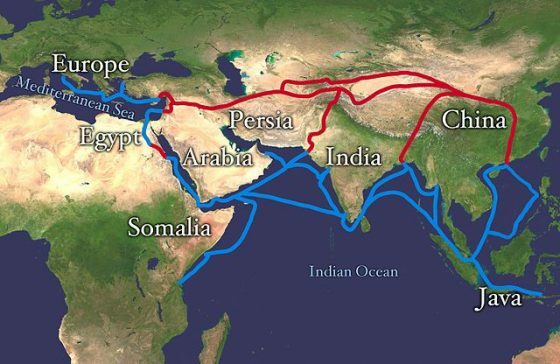 If India becomes a part of OBOR, trade relations of India with Eurasian countries will improve. Despite of being encircled by Chinese projects, India is powerful enough to sustain its influence in the world politics. Hence, there is no need to worry about OBOR. But India should be strict in the case of China ignoring India’s sovereignty. By taking advantage of OBOR, India can overcome its major drawback of lack of infrastructure. In my opinion, China almost covered India in all corners by ‘string of pearls’ and by extending friendship with China, in one way, the economy will grow in a sustained way and a possible threat by China will not be there. But China is a double game player. Because of China only Pakistan and North Korea have developed nuclear arsenal and threatening India and US. Even the Russians are also with China, India should take a clever stand. Priority is the safety of our nation and if there is a pin size possibility that china can harm our country by OBOR then INDIA should not be a part of it because for development of any country the very first concern is safety. I have complete support …the only thing I want to mention that let there be maximum involvement state run financial houses I mean state govt funded projects and less involvement if corporates and making it more based on SOCIALIST ECONOMIC model rather than making it game of super rich world imperialist corporate houses, and oligarchs…. It must be more based on public money collected by govts of different nations like China, Russia, and etc…..
Making world unified economic system for welfare of mother earth and real needy people who are not given their simple fundamental rights ….. Linking of all economic development corridors is must and making it for the people …. In my opinion entire Europe Asia and even Afrika must be linked in these great People’s Economic Development corridors…..
Involving local people, local industries and mainly national Governments….